Little Pink Book: A little update. This week has stretched me in a good way! I get so nervous on first days of any kind, but my apprehension dissolved when I sat down at my desk the first day. These past couple of days, I have been trying really hard to memorize what the process is for everything they are currently teaching me. I want to remember it so I'm not having to ask them all the time. Of course, if I am stumped I will ask questions-work goes smoothly that way. And for the most part, I feel like my training is going smoothly. I'm pretty happy about it, but I know there will be things that I need to take my time to learn. All of the women training me have been super sweet. In my department, there are all women who are around my age. I'm really hoping that I make friends at work as well. I would love to have people who I go to talk, and I want them to feel free to talk to me. That is SO important to me that I feel like I have a community of friends at work. I know that doesn't always happen, but I am keeping my fingers crossed that it will. One person brought me a cute container of purple push pins for me to use to decorate my cube. It was really nice! I need to get some pictures up today! Other than that, I am hoping that I don't get too red when I am introduced in a meeting today. I am having so many feelings and thoughts right now. I am hoping to fit in with everyone. P.S. I feel like I am making a concious effort to plan things now that I am working full time instead of part time. Does having a full-time job or just being busy automatically make you better at time management? sounds like things are going smoothly * * hope u have a super day! Natalie, any one would be blessed to call you "friend". Just be yourself and all should fall into place. God has you right where you are at this point in time for a specific reason. "Trust in the Lord with all you heart; do not depend on your own understanding. Seek His will in all you do and He will direct your paths." I'm glad work is going well, Natalie:) Hope you can meet a great group of gals there, too! 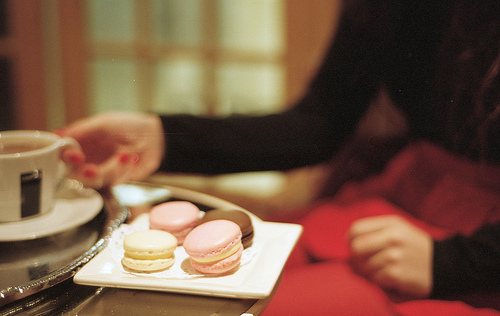 Yum- I want one (okay actually five) of those macaroons! Macaroons always remind me of Nora and Torvald in Ibsen's "A Doll's House." Weird, I know. It sounds like the people you work with are nice- how thoughtful to bring you cute, purple pushpins for your cube. good luck girlie! hope everything is going well. starting a new job can be stressful but it sounds like you are doing well. i work in such an amazing environment with the BEST coworkers. it really helps to come into work everyday and have friends there. hopefully that happens for you soon! That's so exciting! It's so much fun to work with people you actually get along with! I hope you make those connections with your co-workers! Congrats on the new job! I know you're doing awesome! I think the busier you are the more you get done. Somehow you just manage your time better! I'm so excited for you about your new job. Congrats! I'm sure you'll make plenty of friends! I always feel the exact same way when I start a new job. So many times I have had thoughts of quitting on my first day. It's so comforting to know that it will get better . It can only get better. Good luck, you'll be great!